The retractable vertical banner is an excellent way to turn heads at a business convention. 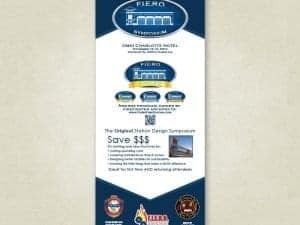 Retractable vertical banners can make very direct, brief statements about what your business has going on, what it intends to accomplish, and the honors it has received. The question is, what is the best method of displaying them? Sticker Genius has the perfect banner display stands for vertical banners. Our banner display stands allow you to move your banner around in style and comfort. When you unfurl your banner, everyone at the convention will recognize that you mean business. Our banner display stands are fully retractable, allowing for the easiest possible transport. You can walk into your expo or trade show floor and have your vertical banners with stands ready to go in mere minutes. All you need to do is hook it to an extender pole, roll it out, and you are ready to go. Our retractable vertical banner stands are meant for products between 70’-92’ in length. 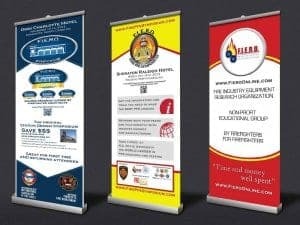 We offer both single-sided and double-sided retractable banner stands. Banner stands are available to rent for people in Southeastern Michigan, as well. Don’t have a vertical banner? Not a problem. Sticker Genius also offers high-quality, durable, customizable, and affordable retractable vertical banners. 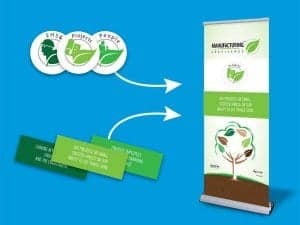 For an additional fee, you can even work with one of our graphic designers to develop the perfect vertical banner stands for your business. We have a committed, engaged group of customer service representatives here at Sticker Genius. They are called the “Stickologists” and their services are readily available to you whenever you need them. If you have a banner display stand rental you need to discuss, a problem with your stand’s hook, or any other pressing issue, they are on call and will give you respectful and quick customer service. Sticker Genius will set you up for success at your next business convention today!